I hadn’t seen Hobbes in a while.He has really gotten big. How well does he play? LOL! 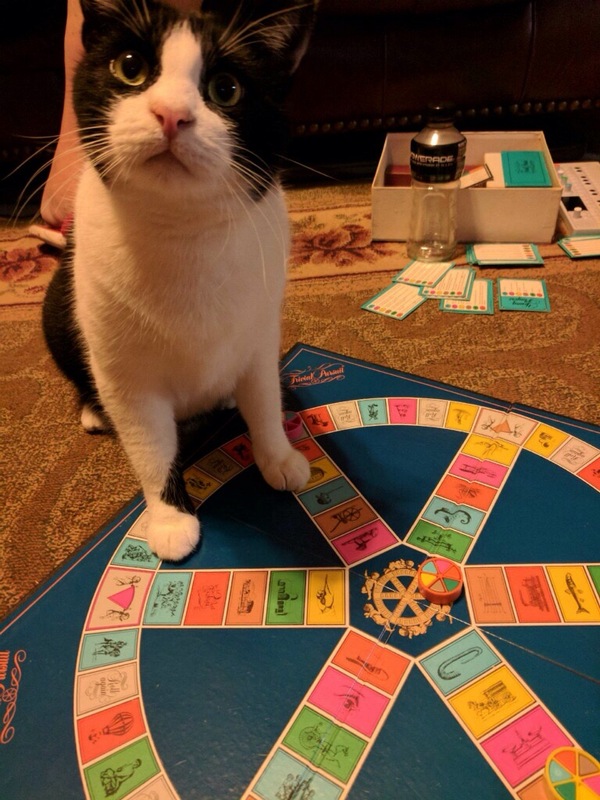 We have one that will try to sit on the board of any game. Heaven forbid, we try a puzzle! I have picture of two of them sitting on a jigsaw puzzle, pieces being swept off the card table by a switching tail. I can totally relate to the puzzle thing. I’ve had many crash to the floor. I’m so sorry I didn’t say hello sooner than this. My owner deserted me for a LOOONG time to go on VACATION, of all things. I was insulted, to say the least. But alas, I’m weak. I missed them so much, I couldn’t help but start purring before they were even in the door. However, then my mistress up and left…AGAIN. To some writer’s conference. As if that could be more important than petting me. Harrumph. Anyhow, she’s home and typing this for me. (One of many things she’ll be doing to make up for treating me so badly.) And it may be late, but you’re looking good, Hobbes. And like you’ve got your household totally under control. Good for you! DUDE! How dare they take a trip and leave you. That’s so wrong. They need their ankles bitten. Hard. Twice. AND the audacity for her to leave again to write- don’t they know there are better uses to put paper to? Like romping through it and scattering it everywhere or batting it to the floor? As for computers, those keyboards are the best thing ever to walk on- Unless you step on the one key that turns on I-tunes. That’s a wake up call for sure. And yes, I am the king of my domain. You need to set your folks in order.